Internets, assemble. 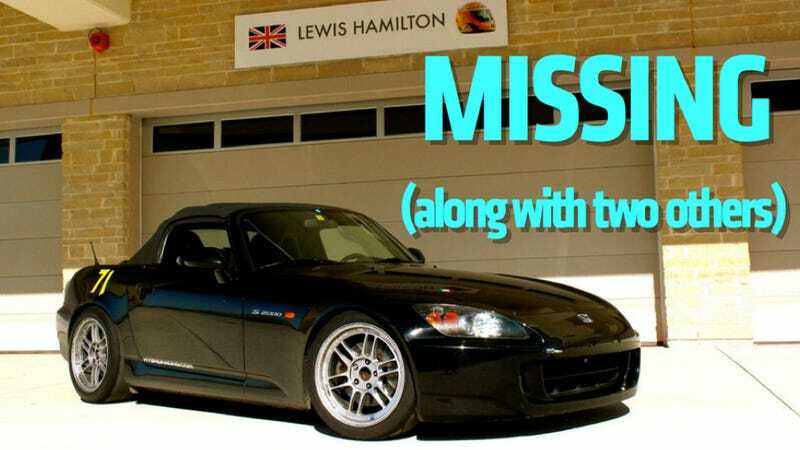 Not one, not two, but three S2000s have been stolen in the Houston area in the past two days. There may be others — these are just the ones I know of via those who've posted about them. My advice? Hide your S2K if you're in Houston. S2000s are somewhat notorious for occasionally being totaled when the front seats get stolen, so to say that most owners are very protective of their cars would be an understatement. To have three go missing in the same week is going to raise more than a few eyebrows. This might be Patrick's fault. One of the victim's apartment complexes in the Galleria area captured video of two white males in a green late 1990s/early 2000s Honda Civic towing his car away at around 2:3o a.m. on July 26. They unlocked the car, placed it into neutral and towed it away with to the Civic. A couple days later, another S2ooo ten minutes away was stolen. Many believe that these two are probably related since they happened so close to each other. Another one in Houston has gone missing since then as well. It may be related, but no one has posted any further information on that car. Any further information is likely to be posted on TrackJunkies or S2Ki. If these turn out not to be a coincidence and someone has three S2000s sitting around in one place, they can't be that hard to find...right? Here's hoping for a speedy resolution for all parties (and a swift kick in the nuts for whoever stole these cars). UPDATE: There's now video of the silver car being stolen, but it doesn't look clear enough to make out a plate.